Activance contains rhodanide a natural and vital molecule found in all living cells (plants, animals and human life) including human hair. In 1993 rhodanide was classified a vitaminoid (vitamin like substance). Similar to vitamins rhodanide plays an essential and indispensable role in cellular activities and acts as a natural antioxidant / purifying agent. Reduced supply or increased demand of rhodanide can lead to symptoms of deficiency. Research studies have shown that thinning, dry, damaged and coloured hair has significantly lower level of rhodanide than healthy, shiny hair. Boosting rhodanide levels revives hair and lengthens the growing cycle, immediately improving strength, shine and growth of each hair. It's the quick and easy-to-use solution that will deliver visible results immediately. Developed and patented by German scientists after 50 years of research and 6 years of clinical studies, Activance is the latest advancement in hair cosmeceuticals and the only rhodanide treatment available. WHY DO I NEED ACTIVANCE? Your hair's rhodanide levels are constantly depleted by day-to-day washing, styling, chemical treatments, stress, health conditions, as well as environmental conditions such as wind and sun damage. This can leave your hair looking dull and lifelss, and eventually lead to it falling out prematurely. By using Activance, you can instantly restore these rhodanide levels and enjoy thicker, shinier, stronger, easier-to-manage hair. 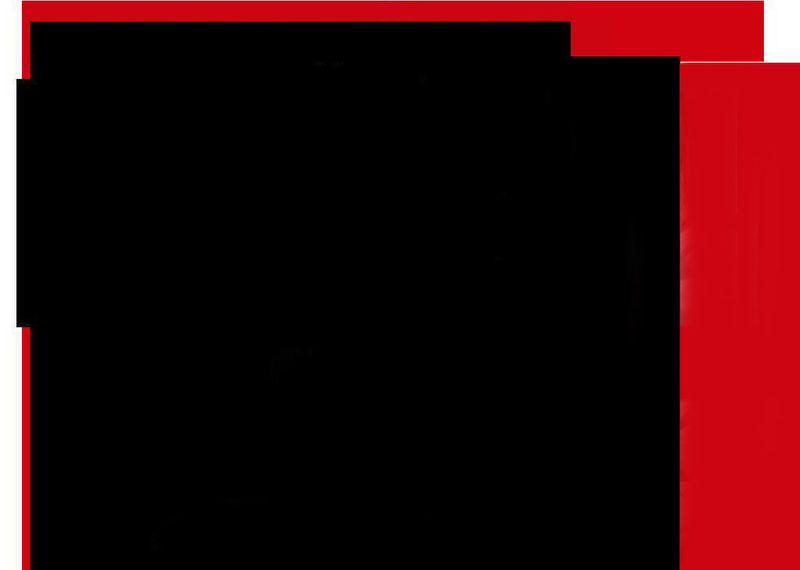 When introduced into Europe in the late 1990's, Activance became the market leader within 15 months. Millions of people around the world now enjoy the beneifts of the vital hair care nutrient, Rhodanide. Because Activance contains natural nutrients, it can be used per directions by men, women (including pregnant and feeding mothers) and children. Activance is a clear, non-sticky, natural lotion that doesn’t coat or weigh your hair down. all other hair & medical products & treatments, ranging from hair colouring to hair medicines & transplants. simply apply daily or every second day, massage in, & style as normal. 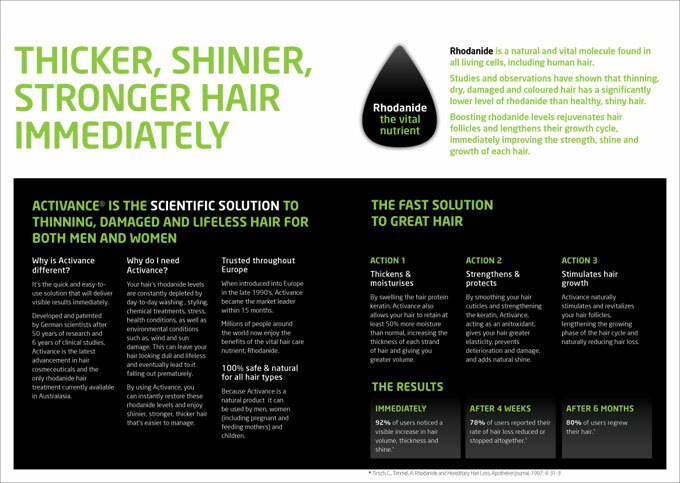 The rhodanide then penetrates your hair & rapidly restores it from the inside, out. It is common knowledge cats and dogs care for their fur/hair using their saliva and when they stop caring for it their fur/hair loses shine. Scientists later found saliva contains the highest level of rhodanide among all body fluids. For generations, applying egg yolk to washed hair was a well known old wives tale for beautifying hair. Scientists later found egg yolks are the richest source of rhodanide in common food. Following World War II, people were under-nourished, suffering from extreme shortage of protein and vitamin rich nutrients (i.e. meat and vegetables - a direct and indirect source of rhodanide), resulting in an increase in infectious disease and mortality. As modern antibiotics were not available at the time; products containing rhodanide (such as Orthromin) were given to humans and domestic animals as a way to combat the spread of infectious disease to increase resistance and survival. Sheep and mink showed unexpected but positive side effects of, increased wool production, shine and enhanced fur quality after being fed a rhodanide enriched diet. 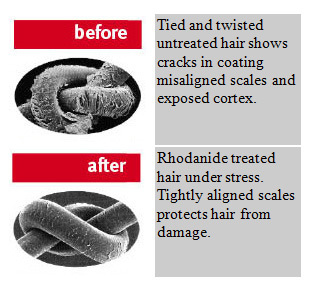 The above important observations led scientists to research effects of rhodanide on hair. For more than half a century German & European Scientists extensivley researched rhodanide; it's biological significance has been documented in over 200 scientific publications worldwide. In the late 1990's European scientists successfully stabilised and patented Activance with rhodanide to revive thinning, damaged lifeless hair for both men and women. Activance contains rhodanide; which consists of nitrogen, carbon and sulphur elements (sulphur is nick-named the ‘beauty mineral’ because it keeps hair shiny and healthy). Hair loses on average 36% of its natural rhodanide level with each washing. The scalp needs several days to replenish the lost rhodanide, which will automatically lead to rhodanide deficiency if hair is washed daily. A twice weekly application of rhodanide is sufficient for the hair to establish a rhodanide depot. Rhodanide, when applied topically to the scalp penetrates along the hair shaft to the roots of the hair. Rhodanide is a very active anion with different bonding capabilities, enabling participation in many biochemical communications and reaction in cells. It strengthens and stabilizes the sulphur-hydrogen bonds of the keratin enabling formation of highly-netted keratin connections between cuticle layers and cortex, thus increasing the resistance of keratin structures i.e. strengthening hair from within, resulting in, stable, stronger, more elastic hair, with increased volume, improved manageability and resistance to damage. Stronger bonding between hair cuticle and cortex also allows improved cuticle scale alignment protecting cortex from damaging external factors. Proper alignment of hair cuticle scales leaves hair shinier due to improved light reflection. The natural shine of hair does not result from any topically applied substance but derives from the light reflection of well aligned cuticle scales on the outer layer of the hair. If cuticle scales are damaged, or not in place the hair lacks protection from all external influences e.g. like a house without a roof. As a natural moisturizing factor rhodanide improves the water binding capability of hair; increasing moisture content by 50%, resulting in an improvement in the hair’s physio-chemical qualities such as volume, elasticity, strength and manageability. This is a lasting effect, since hair treated with rhodanide and dried over a period of 24 hours has a higher mass than untreated hair. Hair remains strong and resistant to mechanical stress and tensile strength is significantly higher compared with untreated hair. Yes, Activance Rhodanide consists of a natural sulphur containing molecule found in all living cells, ranging from plants to animals, including human hair. Based on forty years of research by leading German universities and 6 years of clinical studies for safety and efficacy, Activance Rhodanide is natural, gentle, and safe for women & men. It contains no harsh chemicals, no drugs, no hormones, no toxicity, and no known allergic or negative side effects. It is extremely well tolerated when used on the scalp as directed. Is Activance Rhodanide suitable for all hair types? Activance Rhodanide enhances normal hair, restores chemically treated, dry and damaged hair, adds volume to delicate, fine, or thin hair without coating or weighing it down and revives lifeless thinning hair. 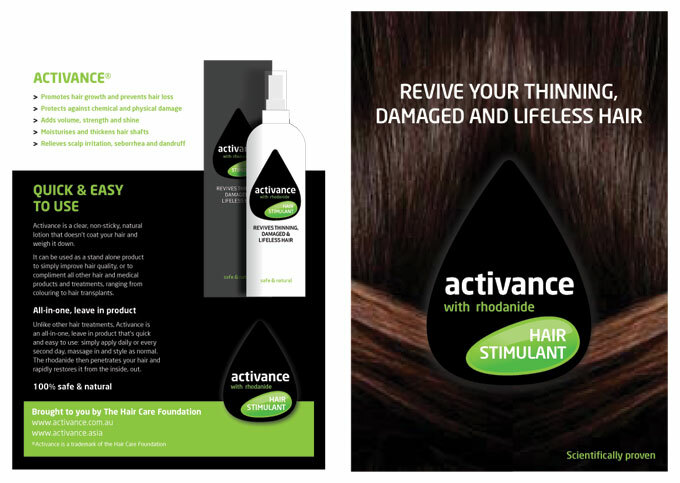 Can Activance Rhodanide be used on dry, oily, itchy, dandruff or sensitive scalps? Activance Rhodanide is hypo-allergenic and extremely well tolerated for all scalp conditions including problem scalps with psoriasis and eczema. Can Rhodanide be used alone or with my existing hair products & treatment? Yes, it can be used alone or in addition to any hair care products; after any salon treatments including colouring and perming, as well as in addition to medicated shampoo and or other scalp treatments/medicine. Is Activance Rhodanide easy to use? It is pleasant to use: a crystal clear, colourless, non sticky, fragrant lotion. Just wash and towel dry your hair; apply about 5ml of Activance Rhodanide, massage through, leave on and style, blow dry etc. as usual. Use regularly, every 2nd day and you will soon see the outstanding benefits. One bottle 200ml will last 2 to 3 months. Is Activance Rhodanide just another hair care product like thousands on the shelf? No, Activance Rhodanide is a unique hair treatment resulting from half a century of extensive scientific research. It revives, moisturises, strengthens and protects hair, like no other. In contrast to many hair care formulations, Activance with rhodanide does not coat the hair: no build up and no residue. How long before I should expect to see results? Improved general appearance of hair: thicker, fuller, vibrant, healthier, shinier hair. Many people have reported their rate of hair loss has reduced within 1 to 2 months. Positive effects on hair growth are often observed between 5 to 9 months, depending on the actual cause in each individual case.